Cutting Rice Krispie treats into squares is so passé. Who are we—Piet Mondrian? Instead, artist Jessica Siskin prefers to turn her Rice Krispie treats into all sorts of crazy shapes including dogs, Taylor Swift covers and Kim Kardashian’s behind. 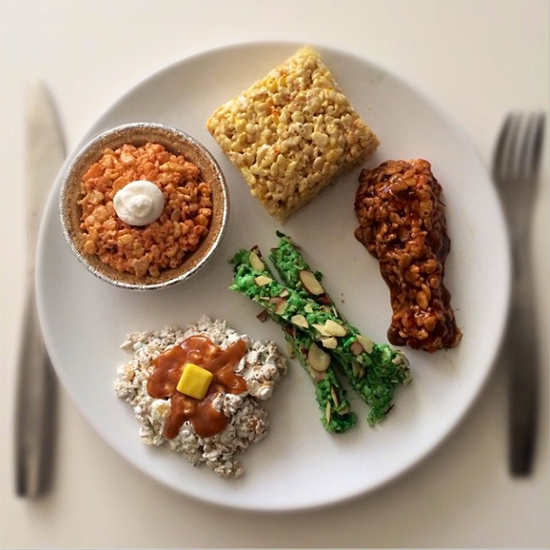 Siskin, a New York City–based grad student, has gained Internet fame by posting images of her Rice Krispie edible art online. Her Instagram account, @Mister_Krisp, has more than 12,000 followers and features hundreds of posts, including purses, bags and bow ties made out of the far-less-exciting-in-milk puffed rice cereal. Yesterday, Siskin even got a write-up in the New York Daily News, which asked her the compelling question: Why Rice Krispie Treats? “They’re actually the only thing I know how to make,” she humbly (or maybe very truthfully) responded. Not surprisingly, her art pedigree seems far stronger than her cooking background: She attended NYC’s New School. Unlike most Internet fame, Siskin’s cereal skills are translating into a potentially lucrative business. She appears to have a forthcoming online shop at MisterKrisp.com. In the meantime, you can email her for custom-made treats that reportedly go for around $100 to $200 a pop. And a snap. And a crackle. Sorry, I couldn’t help myself.